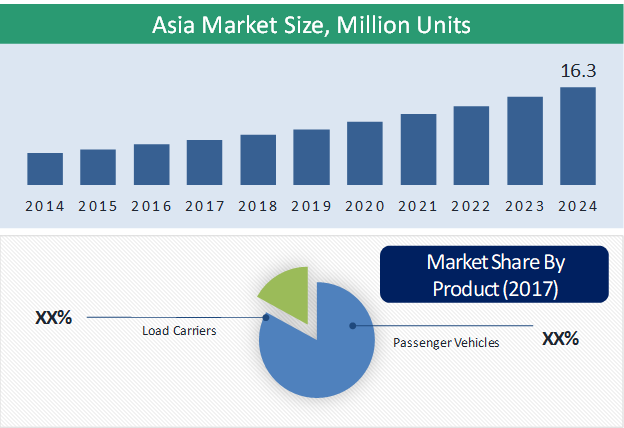 The Asian electric three-wheeler market is predicted to grow at 11.6% CAGR during the forecast period with its fleet size reaching 16.3 million units by 2024. 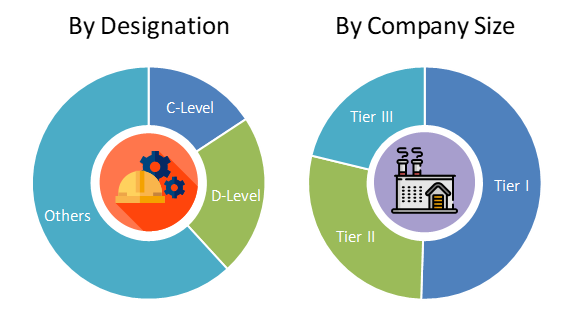 The Asian market is primarily driven by increasing awareness regarding the usage of electric vehicles, technological advancements, and increasing government support and initiatives. The increasing demand for low or no-emission vehicles for public transport supports the growth of the electric-three wheelers market in Asia. Based on product, the market is categorized into passenger vehicles and load carriers. Passenger vehicles hold the larger share in the market due to the increasing demand for the sustainable transport system in metropolitan cities of different countries in the region. On the basis of motor power, the market is segmented into1,500 W. Of all, 1,000-1,500 W powered three-wheelers hold the largest share in the Asian market. The highest share of the 1,000-1,500 W powered three-wheelers in the market is due to the optimum performance and cost of the vehicle at this power. The increasing awareness regarding the usage of electric vehicles, technological advancements, and increasing government support and initiatives are the key factor fueling the demand for the electric-three wheelers market in Asia. For instance, in 2018, Indian government confirmed subsidies for all type of electric vehicles. Faster Adoption and Manufacturing of (Hybrid &) Electric Vehicles II (FAMEII) scheme has been finalized in April this year. As per the scheme, the government will invest INR 5,500 crores (~ USD 784 million) in the next five years. The governing panel decided that the subsidiary will be provided for all kinds of electric vehicles including light electric vehicles. As per the scheme, the government will provide incentives of INR 1,800 to INR 29,000 (~USD 24 to USD 390) for battery operated electric scooters and motorcycles and INR 3.300 to INR 61,000 (~USD 44 to USD 820) for electric three-wheelers. The Indian government is ready to invest around 1.3 billion USD for the rollout of FAME II scheme. Moreover, the lower maintenance requirement of electric three-wheelers also supports the growth of the Asian market. Conventional autorickshaw owners are adopting these e-rickshaw and e-auto for public transport as it saves the cost of maintenance. The consumer finds these vehicles efficient especially for intracity transport as these are best suited for low range travels. Jiangsu Kingbon Vehicle Co. Ltd., Changzhou Yufeng Vehicle Co. Ltd., ATUL Auto Ltd., Xianghe Qiangsheng Electric Tricycle Factory, Kinetic Green Energy & Power Solutions Ltd., Lohia Auto Industries, Terra Motors Corporation, and Jiangsu East YonslandVehicle Manufacturing Co. are some of the key players operating in the Asian electric three-wheelers market. 13.1. Jiangsu Kingbon Vehicle Co. Ltd.
13.2. Changzhou Yufeng Vehicle Co. Ltd.
13.5. Kinetic Green Energy & Power Solutions Ltd.
13.8. Jiangsu East Yonsland Vehicle Manufacturing Co.
Table 72 Snapshot – Jiangsu Kingbon Vehicle Co. Ltd.
Table 73 Snapshot – Changzhou Yufeng Vehicle Co. Ltd.
Table 74 Snapshot – ATUL Auto Ltd.
Table 75 Snapshot – Kinetic Green Energy & Power Solutions Ltd.
Table 79 Snapshot – Jiangsu East Yonsland Vehicle Manufacturing Co.
Jiangsu Kingbon Vehicle Co. Ltd.
Changzhou Yufeng Vehicle Co. Ltd.
Jiangsu East Yonsland Vehicle Manufacturing Co.